It’s Warm & Sunny! A perfect time for this 2015 Naisbitt-Bagley Team 2nd Spring Seller Newsletter to Arrive! The Spectrum reported great news for Southern Utah recently in an article by David DeMille titled, “Wages Starting To Move Upward!” Underneath the title were the words, “4 straight years of sustained job growth in region.” The article said that Washington County wages jumped 6 percent; that Iron County wages were up 5 percent; and that Beaver County wages were up 4 percent in the fourth quarter of 2014 compared to the previous year. Data released by the Utah Department of Workforce Services indicated that this marked the “first major jump in pay for the area since before the Great Recession.” Rising wages and more jobs have to be a good sign of recovery! 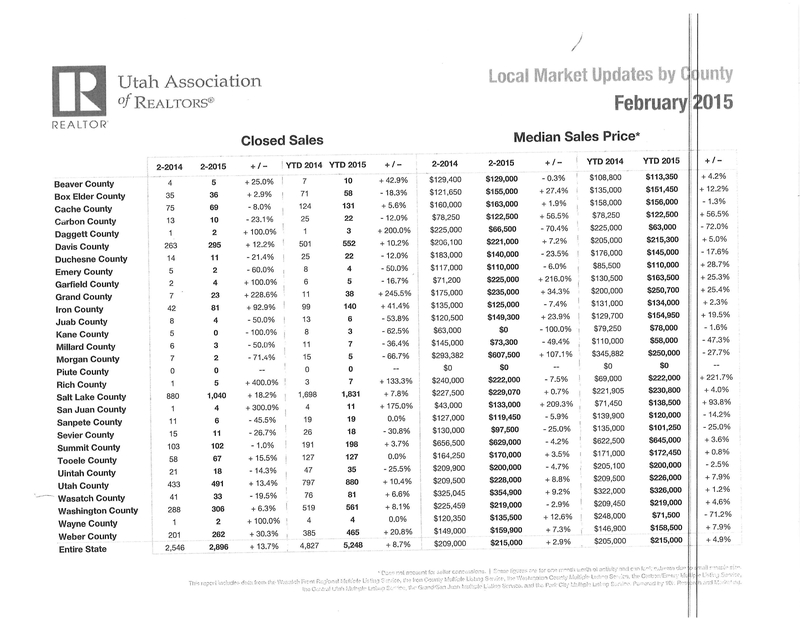 The latest published “Local Market Updates by County February 2015” from the Utah Association of REALTORS (UAR) are attached. In February of 2014, there were 42 sales that closed in Iron County and there were 81 in February 2015. That is a High-jump of 92.9%–nearly double! The year to date (YTD) rise in Iron County closed sales is 41.4% from 2014 to 2015! That is a booming market for the first part of 2015 in my opinion! The Median Sales Price was down 7.4% for the month, but for the YTD it was up 2.3%! Our Iron County median price of $134,000 indicates that buyers are still finding really great home values at great prices in our area. Interest rates are still low, so buyers can purchase homes often for less than rent. Investors are looking for homes and multi-units to rent out so their tenants can purchase their homes for them. Other price ranges are selling when the homes and property are priced competitively. This month we worked with several buyers close to the $300,000 range, and we are definitely seeing more activity in the higher price ranges. That is another indicator of a strong market. The real estate inventory is low enough that we are still seeing multiple offers. I wonder sometimes if there is a magnet somewhere that attracts another offer after the first comes in. We have seen homes that have been on the market for quite awhile attract multiple offers. I do love real estate! I believe it is the best investment there is whether it is your own home or whether you plan to be the landlord. My father was a real estate broker in Bountiful, Utah. I learned from both his words and his example that you have to give good hard honest top service with top knowledge to all of your clients. Buying and selling real estate is one of the major business/personal transactions that take place in any person’s life. We are committed to providing that type of expertise to all our clients and we will continue to work hard to get your property or home sold. How? 1. We will continue to aggressively market your home or property both off and on line. That is the 1st and one of the most important steps needed in getting your home or property sold. However, we work with you as a Team and there are 3 more steps to selling homes and the rest are all up to you as the seller! What are they? 2. Do you want your home or property marked SOLD or for it to just be available for sale? To sell, the home must be priced competitively! Otherwise, the home will just be used as a comparison to help some looker choose a different home. A seller recently came into my office and said she wouldn’t reduce her price even though there was quite a distance between her price and the market value. Even though we showed her sold properties that had gone for much less, she insisted the buyer could just make an offer. The problem with that logic is that buyers shop a great deal both on-line and in person before they make an offer. Why would they make a low offer on a high-priced listing when they can find a better value at the store next door and make a reasonable offer? They may choose not to even look at it. Call if you want to know competitive pricing for your property. 4. ” Let us in!” Recently, I showed homes to buyers who wanted to view nearly 20 homes in the 2 days while they were in town, so they could decide which home they wanted. They had already viewed the homes on-line and wanted a closer look in person. We had the tour all lined up and in order when an agent called and said we would need to view one of the homes an hour later because the baby was taking a nap. Having raised 6 babies, I totally relate and empathize with this dear mom. However, there was no way we could readjust the schedule to include that home when we were showing houses between Parowan and New Harmony including Cedar City and Enoch. With the buyers’ tight schedule, we didn’t have time to back-track. The buyers felt there were plenty of homes from which to choose, so I was told to cancel that showing. How sad! Couldn’t we have tip-toed? If there is any way possible, please allow the tour at the buyer’s convenience. Since most of our buyers are from out of town and plan their trips to pack in the most in the least amount of time, that is very important. Land and commercial ads are attracting calls, but still are slow sellers requiring much patience and lots of advertising. Bargain-priced lots are attracting buyers and new construction homes are selling. Time moves on and as it does, I truly believe our real estate market is on the move and definitely in a good way! Don’t delay! Please call the Naisbitt-Bagley Team today at 435-865-1019 for your free consultation at ERA Realty Center, so we can help you make your realty dreams a reality! You can also text or call Matt Bagley at 435-590-8788; Janet Naisbitt-Bagley at 435-559-7772; and Jennifer Corral at 435-559-0366 and our email address is bagleyteam@gmail.com. Do you have any questions, concerns, or other? We appreciate working with you and we hope to hear from you soon!